Fate Of Missing Malaysia Airlines Plane Still A Mystery : The Two-Way The jet with 239 people on board disappeared early Saturday on a flight to Beijing. So far, a search in the sea between Malaysia and Vietnam hasn't turned up any definitive sign. 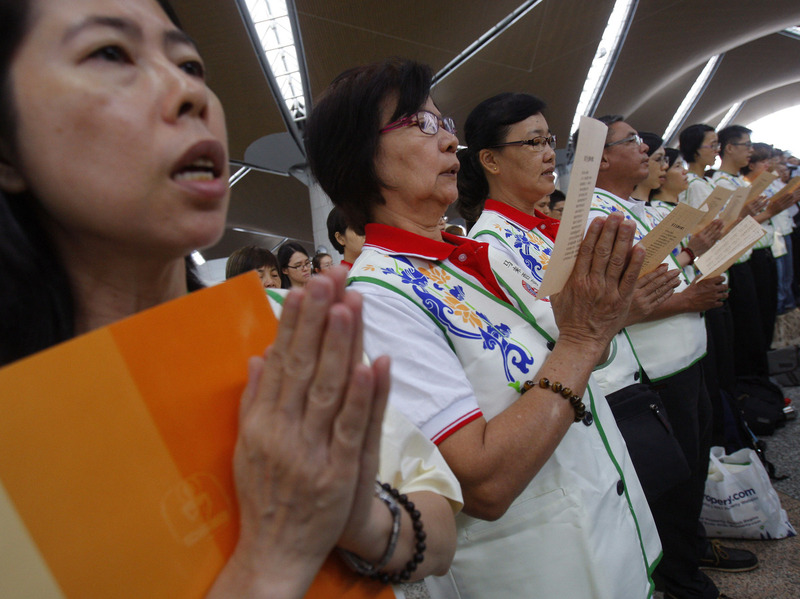 At Kuala Lumpur International Airport on Sunday, prayers were said for the 239 people who have been missing since flight MH370 disappeared. There was a flurry of activity after one search plane spotted a rectangular object Sunday in the South China Sea off Vietnam. That prompted speculation about whether it might be one of the plane's doors. The Associated Press reports that Vietnamese ships searched through the night and into Monday but did not come across the object. Also, "helicopters were scrambled on Monday to a floating 'yellow object' that rescue teams believed could be a life raft from the missing Malaysian Airlines plane — but it turned out to be a false alarm," NBC News writes. "Officials later said it was a 'moss-covered cap of a cable reel.' "
Malaysian officials said Monday that an oil slick that was spotted over the weekend in the Gulf of Thailand has been tested and has been determined not to be jet fuel. USA Today's latest headline sums up where things stand: "We Still Don't Know What Happened To Flight MH370." 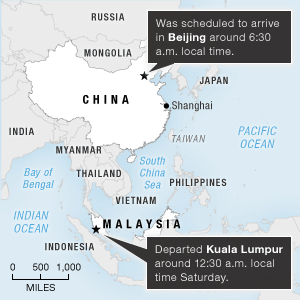 The flight, as we reported starting on Friday evening, took off from Kuala Lumpur around 12:30 a.m. local time on Saturday. The flight to Beijing should have taken about six hours. Instead, within the first hour or two of the flight, "the plane lost contact with ground controllers somewhere between Malaysia and Vietnam," as the AP says. Authorities say the pilots did not issue any sort of distress signal. The investigation has turned up evidence that two passengers were traveling with stolen passports. "The missing passports raised concerns about the possibility of terrorism," CNN notes, but no officials have publicly made such a link and there has been no credible claim of responsibility from any terrorist organization. NBC News adds that intelligence officials say "no electronic 'chatter' has been detected indicating any known terror group was behind the aircraft's mysterious disappearance." "In 2010, when an Air India Express flight from Dubai overshot the runway and crashed in Mangalore, southern India, killing all 158 passengers and crew on board, accident investigators identified 10 individuals on the flight who had been travelling with forged or stolen documents. The incident raised serious concerns at the time about the reliability of Dubai's security checks. "Though terrorism is often the highest concern for authorities when seeking to identify fake travel documentation, those using it are more likely than not to be engaged in illegal immigration, or criminal activity, rather than political violence. "In December, 74 Syrian refugees boarded a Portuguese TAP flight to Portugal from Guinea-Bissau using fake documents. They were caught only on landing in Lisbon, where the Turkish documents they were travelling with were exposed as forgeries." It's also been revealed that five passengers who checked in for the Malaysia Airlines flight never got on board, NPR's Anthony Kuhn reports from Beijing. Malaysian aviation officials say those passengers' bags were taken off the jet before its departure. All in all, this is an "unprecedented aviation mystery," says Azharuddin Abdul Rahman, the head of Malaysia's Civil Aviation Authority.